The Lume Cube Professional Lighting Kit packages two Lume Cube 1500-lumen LED lights with gels, color filters, barndoors, snoots, and other accessories to provide a comprehensive lighting kit for the professional content creator. Most of the accessories magnetically attach to the included Modification Frame and can be stacked up. 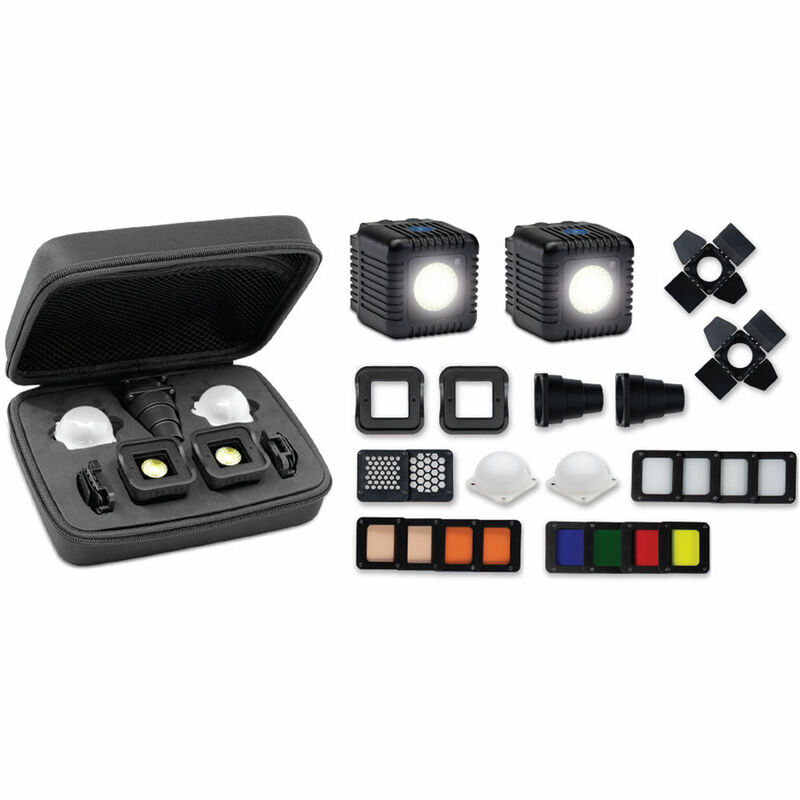 The Lume Cube lights are ultra-compact, waterproof, and highly versatile, suitable for numerous applications. They can be used for photo and video capture with standard cameras, smartphones, and action cams, indoors and outdoors, in daytime and nighttime. Their compact size and 1/4"-20 threaded mounting hole allows you to use them with a wide variety of mounting accessories. The Lume Cubes are powered by an internal battery that runs approximately 20 minutes at full brightness and over two hours at half brightness. Snap this Modification Frame from Lume Cube onto your Lume Cube LED light so you can add the optional modification accessories such as gels, filters, barndoors, or a snoot. The frame quickly snaps onto the light and its metal construction allows the Lume Cube accessories to connect with their built-in magnets. Note: The frame is designed for the Lume Cube, and it is not compatible with the Lume Cube AIR. The CTO 4 Pack for Light-House Lume Cube Housing consists of four color temperature correction gels in individual plastic frames with integrated mounting magnets. The gels can be used to warm up the native 6000K color temperature of your Lume Cube light fixture (not included). Designed to fit into the Lume Cube Light-House (not included), each gel provides a different degree of warming to your light's output and is made using Lee Filter Zircon filter material. The 806 Warm Amber 2 corrects cool white LED to tungsten, the 807 Warm Amber 4 corrects White LED to tungsten, the 808 corrects warm white LED output to tungsten, and the 809 Warm Amber 8 is for fine correction of warm white LED light to tungsten. Each filter attaches to the housing magnetically, and you can use the filters individually or stack them for stronger effect. The RGBY Color Pack for Light-House Lume Cube Housing consists of four color filters in individual plastic frames with integrated mounting magnets. This pack features one red, one green, one blue, and one yellow fitler. Designed to fit into the Lume Cube Light-House (not included), each gel provides a different degree of warming to your light's output. The Honeycomb Pack for Light-House Lume Cube Housing from Lume Cube provides shape and control to the output of your Lume Cube (not included). You can use either of these grids for spill control when using diffusion. The magnetic grids come in two sizes: a large and small grid pattern. Snap on the hinged, four-leaf Barndoors from Lume Cube onto your Lume Cube LED light and control the light's beam to reach areas that you want, and keep light from areas you don't want to illuminate. The barndoors require the Lume Cube Modification Frame or Light House Cage to allow it to be connected by magnets to the front of the light. Note: Barndoors require the Lume Cube Modification Frame or Light House cage to connect it to Lume Cube. It is not compatible with Lume Cube AIR. Pop on this Snoot from Lume Cube onto your Lume Cube LED light, and narrow the light's beam to a smaller area. A more focused light is suitable when shooting small subjects or for accent lighting. The snoot requires the separately available Lume Cube Modification Frame or the Light House Cage to easily connect via magnets to the front of the light. Note: The snoot requires the Lume Cube Modification Frame or Light House Cage to connect it to Lume Cube. It is not compatible with Lume Cube AIR. The Diffusion Bulb Pack for Light-House Housing for Lume Cube from Lume Cube diffuses the output of your Lume Cube. In addition to providing a diffusion effect, the Diffusion Bulb spreads the beam out to the sides, creating an overall ambience. There are three different strengths in the pack, a light, medium, and strong diffusion, and each one attaches magnetically to the Light-House Housing (not included). Although you cannot stack one Diffusion Bulb on top of another, you can mount the Diffusion bulb on top of a color gel, warming filter, or even another diffusion gel. Box Dimensions (LxWxH) 4.4 x 3.0 x 1.1"
Box Dimensions (LxWxH) 4.4 x 3.0 x 1.0"
Box Dimensions (LxWxH) 4.3 x 3.0 x 0.9"
Box Dimensions (LxWxH) 4.45 x 2.95 x 1.05"
Box Dimensions (LxWxH) 2.2 x 1.7 x 1.7"
Box Dimensions (LxWxH) 6.7 x 4.9 x 1.3"